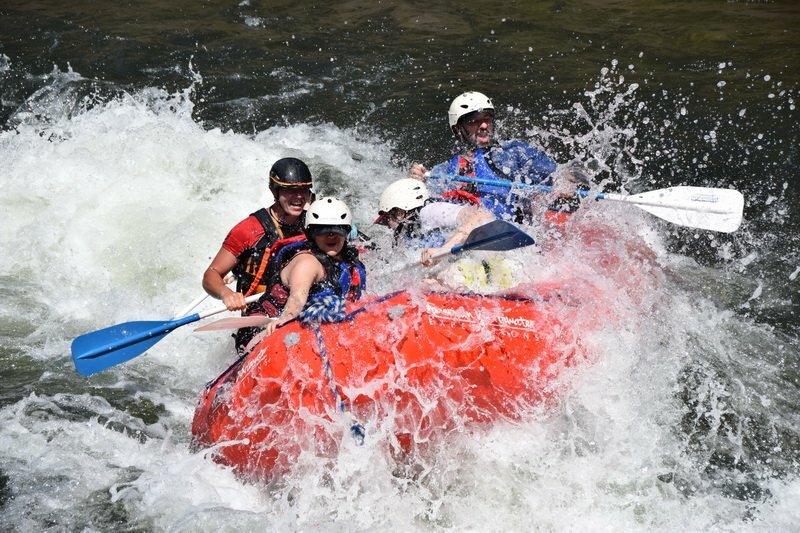 The Super Combo is the best Spring trip we offer with LOTS of river time, fun and action. Raft two exciting rapid-filled days on the whole river run of the South Fork the first day, then the North Fork on the next day. That’s 30 total river miles of thrilling whitewater. By FAR the most bang for your BUCK. Arrive the day before your trip at our deluxe river campground, complete with indoor restrooms and free hot showers, swimming pool, volleyball court, and more, situated just above Troublemaker Rapid on the South Fork. 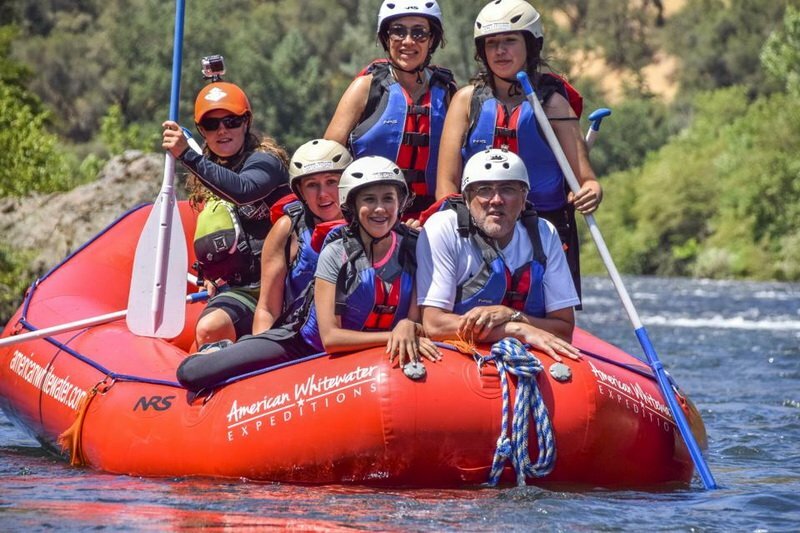 Your 2 day South Fork and North Fork American river adventure begins with a hearty breakfast and then you head off to the top of the South Fork of the American River for a full day of fun, laughter, excitement, and lots of exhilarating whitewater. Our shuttle will drive you to the put-in at Chili Bar where you will paddle your way through rapids such as Meat Grinder, Triple Threat, and the famous Troublemaker. A hearty deli-style lunch is served at our riverside lunch site. Then you’ll head downstream to the Gorge, a canyon filled with rapids such as Satan’s Cesspool, Bouncing Rock, and Hospital Bar. After the last rapid our Honda Jet Ski will tow the rafts across Folsom Lake to the take-out. At the end of the day’s rafting, cold beverages and transportation back to camp await you. At camp you can enjoy some tasty hors d’oeuvres, a hot shower or free time until we serve a delicious, healthy dinner with dessert that will satisfy the heartiest appetite. On the second day your adventure begins early following a delicious continental breakfast. Heading off to the North Fork for a day of thrills, challenges, and excitement as well as real wilderness experience. The North Fork American features almost continuous technical whitewater rapids. You’ll slalom through Chamberlain Falls, Bogus Thunder, Staircase, and many more. While a hearty deli lunch is served along the river or at takeout depending on water flows, you can enjoy the spring wildflower display, lush foliage, and abundant wildlife. The last few miles of your adventure offer a slower pace allowing you to catch your breath, relax and enjoy the beautiful scenery of the canyon. Please check our Equipment List for items you will need for your North Fork rafting trip as well as Maps and Directions to our River Camp. We look forward to seeing you and get ready for some rafting action. Additional nights of camping and meals are available. Please call us 1-800-825-3205 or contact us for details. NOTE: There is an 8% Govt Land & River Use Fee added to all prices above.